The holidays are here and we offer you this week a walk through vineyards and gardens. 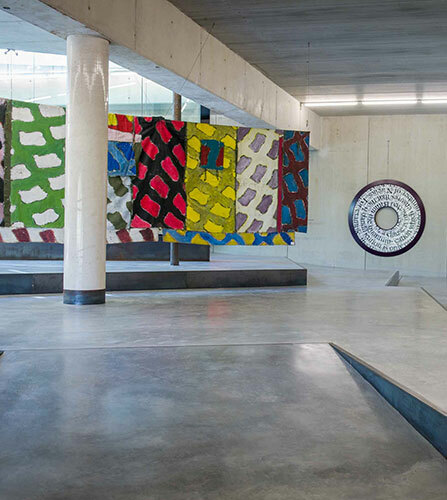 Then toward the South of France for three exhibitions in wineries known for their love of contemporary art with Lee Ufan at Château La Coste, Benoit Lemercier at the Château Sainte-Roseline and an exhibition of contemporary artists at the Commanderie Peyrassol. 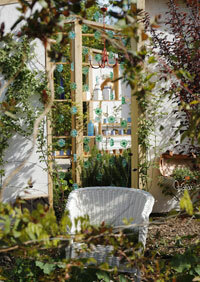 Unless you prefer to walk among the fantastic gardens of the 25th Garden Festival at the Domaine de Chaumont. And also, travel through photos by Alain Kramer, Giverny with the Impressionist menu of chef Eric Guerin at the Jardin des Plumes, in Arc-et-Senan with the 16th Garden Festival or in Provins with Crins de Feu, for an impressive equestrian show, the streets of Rouen revisited by Street Art artists to Madrid for a major exhibition devoted to Caravaggio and his influence on Nordic painting of his time, in Saint-Etienne to get to the heart of the colorful history of ribbons before finishing on the hill of Tain-Hermitage with a work of Land Art. Every week, the PLUME VOYAGE magazine offers you a selection of cultural news and international exhibitions. Come on, it is all happening now! Lee Ufan at the Château La Coste. 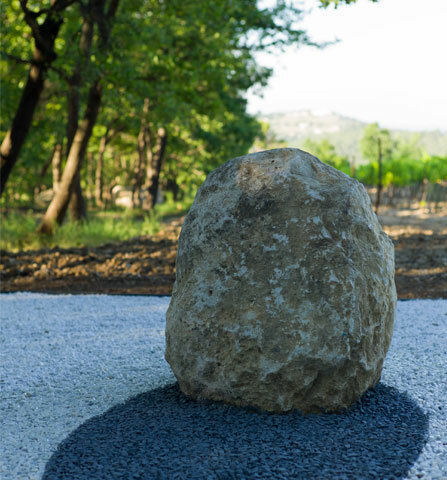 A few kilometers from Aix-en-Provence, the Château La Coste, in collaboration with Lisson Gallery and Kamel Mennour, are presenting an exhibition of new and recent works by Lee Ufan, the first since the presentation at Versailles in 2014. Located in an intimate space, where the walls are used as canvases on which Lee Ufan applied his characteristic brushes strokes, the work is marked by a large stone near the building entrance. The stones, finely crushed that the Korean artist mixes to his paintings connect his works in two dimensions and his three-dimensional sculptures in a physical way. Benoit Lemercier at the Château Sainte-Roseline. Benoit Lemercier offers here an artistic vision of the mysteries of the world around us. Based on various scientific theories, he takes us on a journey into the heart of matter. The exhibition at the Château Sainte-Roseline, in the heart of the Var, composed of monumental sculptures, is presenting a poetic vision of the infinitely large and the infinitely small through Hypercubes and Superstring series. This exhibition is part of the sixteenth summer exhibition initiated by the Castle, famous for its historical heritage and its winery. Industrial aesthetic at the Peyrassol Gallery. that is held this summer the Industrial Aesthetics exhibition. 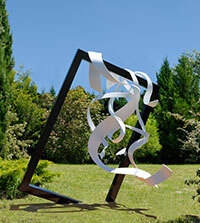 It seeks to illuminate the various forms incorporating industrial elements in the field of art. The opportunity to discover significant works by César, Arman, Bernar Venet, Bertrand Lavier, Jean-Pierre Reynad or Frank Stella. Natural extension of ​​the park of monumental sculptures, the Peyrassol Gallery was designed by architect Charles Berthier and welcomes the personal collections of the owner of the Commanderie, Philip Austruy, as well as temporary exhibitions of contemporary art. Real panorama of world wide landscape creation, the International Garden Festival this year celebrates its quarter century with as central theme, gardens from the next century. So these are gardens concernent about the big issues of our time such as climate change, rising sea levels, floating gardens, the relationship between habitat and gardens … So many subjects that allow invited gardeners and landscapers to surprise us and tell a story with the imagination and the creative fantasy that characterize them. 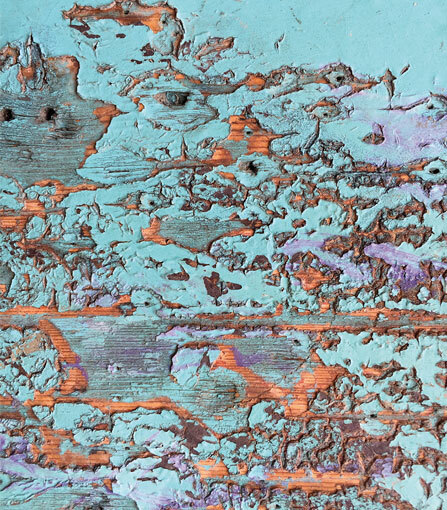 "Alain Kramer - Photographic Paintings"
at the Luxembourg Orangerie, Paris. Camera in hand, by wearing his gaze on details rather than the whole thing, Alain Kramer reveals in this apparent disorder of balances, harmonies and feels vibrations. He decides to call the shots photographic paintings. There is no upstream staging or subsequent technical manipulations to his photos. From New York to Bangkok via London and Paris, each city has a vibration, an energy and its own sensitivity that Alain Kramer restores with his images as they appeared to him. Don’t wait to discover this amazing work! Impressionist menu at the Jardin des Plumes, Giverny. Giverny is a paradise for lovers of impressionist painting, between the sublime gardens of Claude Monet Museum and the Museum of Impressionism. This is where the brilliant young chef Eric Guerin opened the Jardin des Plumes. 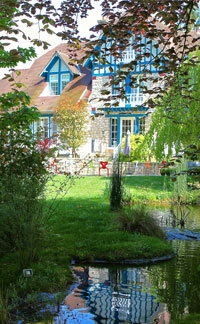 A beautiful house from the early nineteenth century, which houses an 8 room hotel and a Michelin-starred restaurant. On the occasion of the Normandy Impressionist Festival (which runs until September 26), Eric Guerin and the Chef Albert Riera have devised a menu that honors the palette and color so well rendered by the Impressionists. Dazzling shades and flavors that transcribe the lights of the day dear to Monet, from dawn sweetness until dark early hours of the night. Just like the greatest painters, the two chefs manage to propose creative dishes and stunning beauty to be enjoyed such as works of art. at the Saline Royal, Arc-et-Senan. 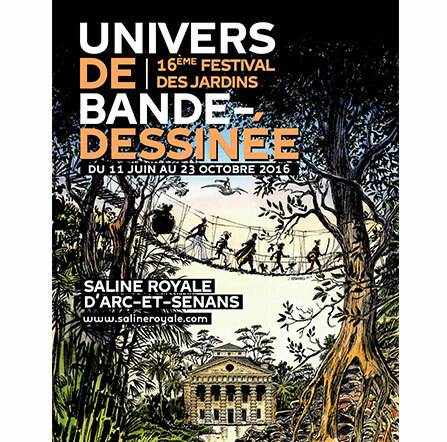 For its 16th edition, the festival of Saline royale d’Arc-et-Senan gardens has combined bubbles and chlorophyll by plunging visitors into the world of comics. Carved beetles guide visitors throughout an initiative journey. A fantastic vagrancy which opens onto a mystical flight on which plants thrive in symbiosis with structures sometimes metallic, sometimes wooden. Tropical or desert, strange animals and new planets, utopian cities and magical plants, moving from one fantasy to another in an extraordinary excursion. Crins de feu in Provins. We knew about the toro de fuego, these animations that blend parade and fireworks. It is now the equestrian and poetic versions of it. To mark the festival of Lueurs du Temps taking place this summer, the medieval city of Provins is lit by the light of thousands of candles at the foot of the ramparts, les Crins du Feu depict horses of artifice. 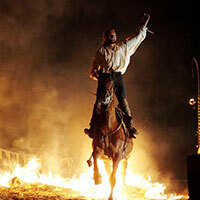 Dances with flaming poi and garroches, vaulting and dressage, riders and horses are in total harmony and engage in high level equestrian prowess. A ballet full of poetry. 3rd edition of Rouen Impression. 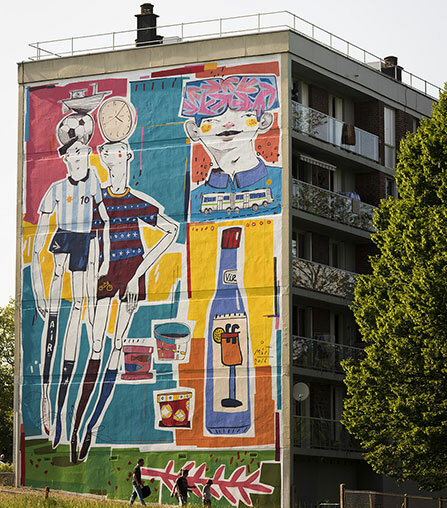 which will rhythm summer, the third edition of Rouen Impressionée tackles Street Art. And gives freedom to contemporary art to invest and transform the facades of the city. For over two months, twenty artists will follow one another to think and paint a portrait of Rouen. These national and international artists will sign exceptional murals and ephemeral achievements in XXL format. This group exhibition is illustrated in the form of three art walks in the city center, the Seine and the area of ​​the Pines. 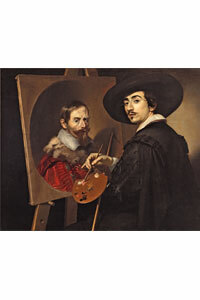 "Caravaggio and the Northern painters" at the Thyssen Bornemisza museum, Madrid. Michelangelo Merisi Da Caravaggio, better known as Caravaggio, greatly influenced painters in Northern Europe, fascinated by his paintings, and who have widely disseminated his style. Through about fifty paintings, including a dozen of Caravaggio, from private collections and museums around the world, the exhibition offers a panorama of the career of the Italian artist from the Roman period to the darkest works his last years. But above all it helps to understand how his work has influenced famous painters whether in the Netherlands, Flanders and France. at the Museum of Art and Industry, Saint-Etienne. Used since the XVIe century, the ribbon can be found in every fashion style, from Marie Antoinette to the Empress Eugenie through contemporary art. From the late eighteenth century, the ribbonery activity gradually shapes the city of Saint-Etienne, its neighborhoods and employs up to 30,000 people in the mid nineteenth. 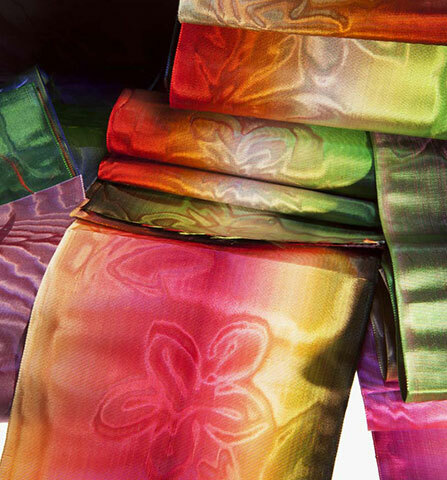 For this exhibition, the ribbons treasure of the museum steps out of its reserves and provides in abundance. The ingenuity of textile technicians and great workers, strong personality and foresight manufacturers open to innovation has generated a surprising diversity of this indispensable accessory. 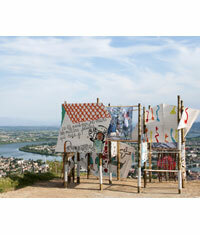 Just like the follies of the eighteenth and nineteenth centuries, the installation at the top of the hill of Tain l'Hermitage was created by the association La Sauce Singulière, based in Lyon.